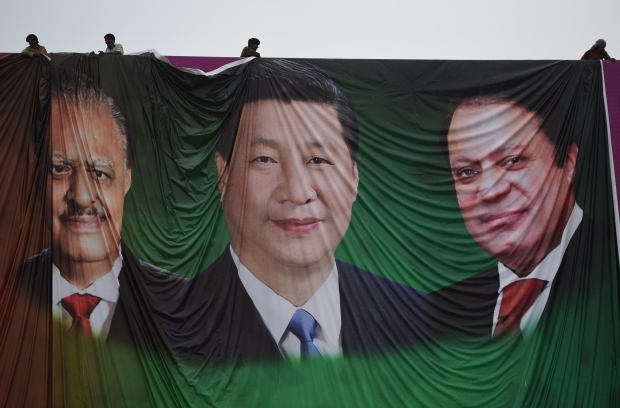 A billboard featuring the likenesses of, from left, President of Pakistan Mamnoon Hussain, Chinese President Xi Jinping, and Pakistan Prime Minister Nawaz Sharif in Islamabad last week. Xi Jinping’s trip to Pakistan was an unusually significant visit. While previous trips by Chinese leaders have often been overshadowed by their prior swing through New Delhi, this was a rare stand-alone celebration of an “all-weather friendship” that will increasingly be looking to Pakistan’s west, rather than at the two sides’ South Asian neighbor India. The ambitious plans for a $46 billion China-Pakistan Economic Corridor (CPEC) naturally attracted much of the attention—this would be the largest international development-focused investment effort that China has ever attempted. While skepticism about the feasibility of all the pipelines, roads, railways, and energy projects is warranted, the economic impact for Pakistan will be significant even if only a quarter of them ever come off. As a “flagship project” of Xi’s signature “One Belt, One Road” initiative, it is also a symbolic test case for the whole strategy. The history of economic relations between China and Pakistan has undoubtedly been laden with disappointment but this time the success of CPEC has serious political capital behind it from both sides. The enormous dollar figures attached to China’s investment plans drew the public focus away from what remains the foundation of the China-Pakistan relationship: security ties. Here too, Xi’s visit highlighted the fact that we are entering a new phase. Pakistani ports are not just going to be the endpoint of an economic corridor, but staging posts for the PLA Navy as they seek reliable facilities for their growing activities in the Indian Ocean, the Gulf of Aden, and beyond. Recent political shifts in Myanmar and Sri Lanka have emphasized the fact that Pakistan is the only partner in the region that China can count on. The visit saw public announcements of Chinese companies’ forty-year lease on Gwadar port, and shortly before Xi arrived news emerged of a major Pakistani purchase of Chinese submarines. Naval cooperation is set to be an ever more important part of the two sides’ relationship in the coming years as Pakistan facilitates China’s power projection capabilities beyond the Asia Pacific. Xi’s visit also put more emphasis than ever before on counter-terrorism. With attacks in Xinjiang and in major Chinese cities escalating in recent years, the pressure on Pakistan has grown. Not only has Beijing pushed the Pakistani army to conduct operations against militant safe havens in North Waziristan, it has also stressed China’s interest in seeing Pakistan facilitate a stable outcome in Afghanistan rather than acting as spoiler. Xi’s speeches and articles were filled with praise for Pakistan’s counter-terror efforts, and offers of deeper cooperation, but the level of public emphasis also served as a warning. If the security situation in the region deteriorates after the drawdown of U.S. troops in Afghanistan, and China sees Pakistan’s approach as inadequate or counterproductive, many of the grand-scale Chinese investments will not be forthcoming. For China, Pakistan serves as a useful hedge against India’s rising power. From the perspective of Beijing’s strategic logic, it is better to have India encircled on land (from west to east) and, if possible, from the sea as both Beijing and New Delhi find themselves locked into an increasingly intractable security competition. In addition, arming Pakistan (which is an ongoing effort, distinct from the recent investment announcement) is a backdoor way of nullifying—or at least mitigating—India ’s growing nuclear threat to China and New Delhi’s expanding second strike capabilities. Just as Pakistan has never truly recovered psychologically or physically from the 1971 war with India, India has never recovered psychologically from the 1962 border war with China. A security competition with triangular dynamics is in full swing in South Asia. More importantly, however, China’s decision to invest in Pakistan augments its own “pivot to Asia” strategy. While the U.S. has “pivoted” to East Asia in recent years, China has been pivoting to Central, South and West Asia since at least the mid-1990s. The long term purpose of what is now labeled the Silk Road Economic Belt/Maritime Silk Road is to create a Chinese sphere of economic and political influence throughout the Asian mainland all the way to the Middle East. The Shanghai Cooperation Organization (SCO) is one institutional mechanism—which Pakistan may possibly join as a full member this year through which Beijing pursues this strategy. For China, Pakistan is viewed as a dependable ally (and potential logistical or even military base) located astride the Arabian Sea; this arrangement provides Beijing with multiple economic and political benefits. At the same time, many Chinese leaders are worried about Pakistan’s internal security challenges, such as extremist violence, and the potential for such challenges to adversely affect China’s western regions, particularly the Xinjiang Uyghur Autonomous Region (XUAR). Thus, Beijing has enormous incentives to keep Pakistan economically viable and stable. China’s recent investment decision is one step in this larger calculus. We should expect similar initiatives and announcements in the years ahead. President Xi’s visit to Islamabad is indeed a watershed in Sino-Pakistani relations. From the Pakistani perspective, Andrew Small correctly observes that even if China delivers a small fraction of the promised $46 billion in new investment, it would bring real benefits to a country that craves cash and desperately needs to develop its infrastructure, especially in the energy sector. The visit is a big confidence-booster for Pakistan’s civilian leaders, who have courted Beijing assiduously for years but until now had little to show for their labors. And for Pakistan’s military, the Chinese embrace—not to mention a $6 billion submarine deal—offers a timely reassurance in the midst of a difficult fight against homegrown Taliban insurgents, and a solid guarantee against the ever-present Indian threat on the eastern front. The only damper on Pakistan’s enthusiasm could come next month, when Indian Prime Minister Narendra Modi is scheduled to arrive in China for a high-profile visit that will emphasize Sino-Indian cultural connections. Seen in the context of China’s foreign policy, President Xi's Pakistan policy reflects an increasingly ambitious global agenda that will project Chinese power and influence into western Asia with deeply transformative consequences. The leading edge of this influence tends to be economic and commercial, but geopolitics will follow—in South Asia, Central Asia, and, increasingly, the Middle East. The China factor will play into existing sub-regional rivalries, national political debates, and even provincial-level developments in ways that we are already witnessing throughout much of East Asia and the Pacific region. To manage its newfound influence on its western front, particularly when China finds itself at the center of unforeseen conflict, Beijing will require a higher level of diplomatic sophistication and regional expertise. At a time of American retrenchment from Pakistan (and neighboring Afghanistan), the question is how Washington should react to China’s expanding regional role. Given the tortured history of American dealings with Pakistan in the post-9/11 period, U.S. policymakers could be forgiven if they were to perceive an opportunity to cede the ground to China outright. Pakistan, at least in the short to medium term, is hardly a strategic prize for the United States. Unlike in the Cold War, when Islamabad offered Washington the (often overstated) means to check the southward expansion of the Soviet Union, today Pakistan comprises a nasty bundle of security threats from which the United States is mainly interested in insulating itself. Realistically, however, China is in no position to singlehandedly “fix” Pakistan, at least not in ways that would permit the United States to divest itself quickly from its counterterror, nonproliferation, and even development missions there. Instead, Washington should seek to work closely with Beijing to harmonize mutual efforts at stabilizing and developing Pakistan’s economy, encouraging Islamabad to tackle internal security threats (from the Pakistani Taliban and violent sectarian outfits), and sever ties with terrorist proxies (like Lashkar-e-Taiba) that threaten regional and global security. To address other concerns, such as nuclear nonproliferation and the regional power balance, where U.S. and Chinese goals are more likely to be at odds in Pakistan, Washington would also be better off retaining a seat at the table in Islamabad. There, U.S. officials will need to learn how best to exercise influence derived from offering strategic alternatives to Pakistani leaders who, over time, will also begin to perceive downsides in overdependence on their powerful Chinese neighbor. In the recent China-Pakistan agreements unveiling the Economic Corridor linking Gwadar with Kashgar, I see both an enormous undertaking with “win-win” potential, as well as a multi-faceted hedge on the part of Beijing. On the surface of the deal, Pakistan receives Chinese financing for its antiquated power infrastructure and, in exchange, China gains a strategically rich pathway to the Indian Ocean promising eased access to Gulf oil and enhanced naval projection capabilities. From Beijing’s perspective, however, the deal also carries a convenient hedge against the uncertainty of its future relations with several neighbors in the troubled South China Sea, as well as with India, a long-standing rival. As an important component of the “One Belt, One Road” strategy extending Chinese influence and access through Central, South, and Southeast Asia, the China-Pakistan Economic Corridor ensures China an additional gateway to Gulf oil, thus reducing its dependence on passage through the Straits of Malacca controlled by Malaysia and Indonesia. This flexibility is particularly valuable to China given its ongoing disputes with a number of its maritime neighbors in the South China Sea (including both Malaysia and Indonesia), and as a solution to the Diaoyu / Senkaku Islands issue with Japan remains elusive despite calmer rhetoric in recent months. While China has little to gain from prolonged maritime disputes dswith its neighbors, the Gwadar port offers it flexibility in negotiations and a backdoor in the event of full-blown conflict off its coastline. The Economic Corridor provides Beijing with a similar hedge against the possibility of tension with India. Although there is strong reason to believe in the prospects of improved Sino-Indian relations, and Indian Prime Minister Narendra Modi is saying all the right things, history continues to weigh heavy for China and India, their relations perpetually tinged with mutual suspicion. It is also unclear how Modi will respond to the China-Pakistan agreements and the additional Chinese submarine sale; these issues will surely cast a shadow over his anticipated visit to China next month. This deal is also significant as a reaffirmation of the China-Pakistan relationship following years of latent tension over the terrorism issue. At the same time, critics are right to point out that the Economic Corridor will cross dangerous terrain, through Baluchistan in Pakistan and into western Xinjiang in China, two regions racked by violent, ethno-nationalist conflict. Aside from vague Pakistani pledges to protect Chinese workers along the Corridor with armed troops, the agreements don’t seem to address any direct efforts to undermine terrorism in Pakistan, and limit its cross-border influence on Xinjiang. Here, Beijing seems to be deploying its long-held belief that separatist threats will diminish as stability spreads amidst an improved socio-economic infrastructure— a strategy that has so far failed to quell nationalist unrest in both Tibet and Xinjiang.